It’s been six weeks since Daisy came back to live with us. At first it was a difficult transition since she was sick and the weather was so hot. Lately though, having a chicken in my backyard again has been a joy and a pleasure. She’s gotten well and breathes fine in the cooler temperatures plus she seems to have a fun life and a healthy chicken routine. The word is out that there is an illegal and dangerous creature living on Ring Around Road, but for now all is quiet and peaceful. The Home Association has received one email notifying them that I have “chickens” in my back yard. I asked who it was but they said the email was anonymous. Seems like if an issue is important enough to complain about, you’d be brave enough to identify yourself. In the mean time, I have numerous visitors coming to play with Daisy. Some kids are getting their first chicken encounter of their lives in my backyard and I am happy to provide the service. 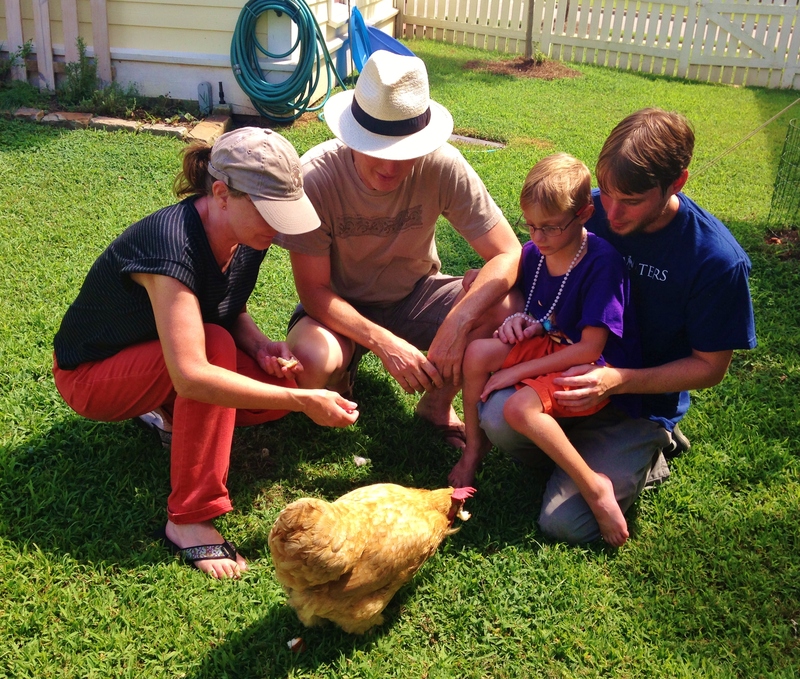 James (wearing the awesome hat) lived in a progressive community near Atlanta (Serenbe-Google it–amazing place) where residents are allowed to have small urban flocks in their yards. 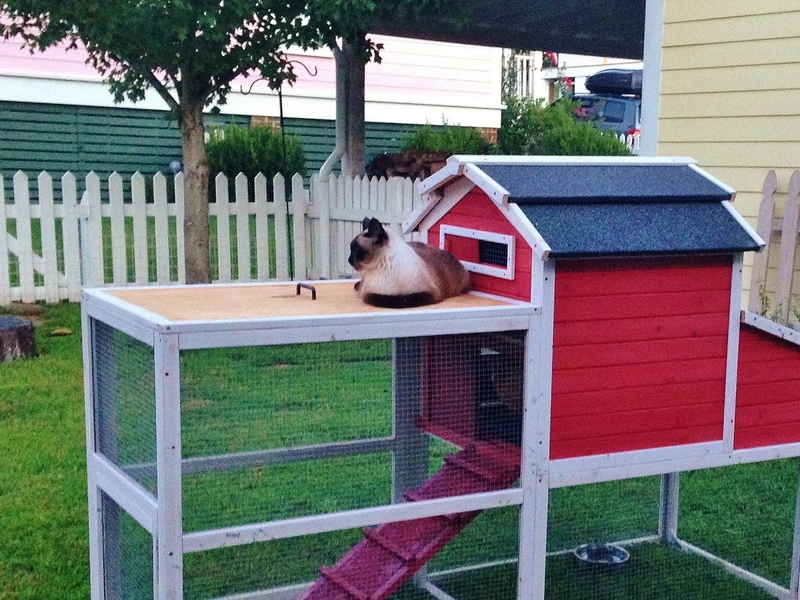 He said it was a wonderful place to live and he’d be happy to help me persuade the Waters folks on the merits of urban chicken farming. 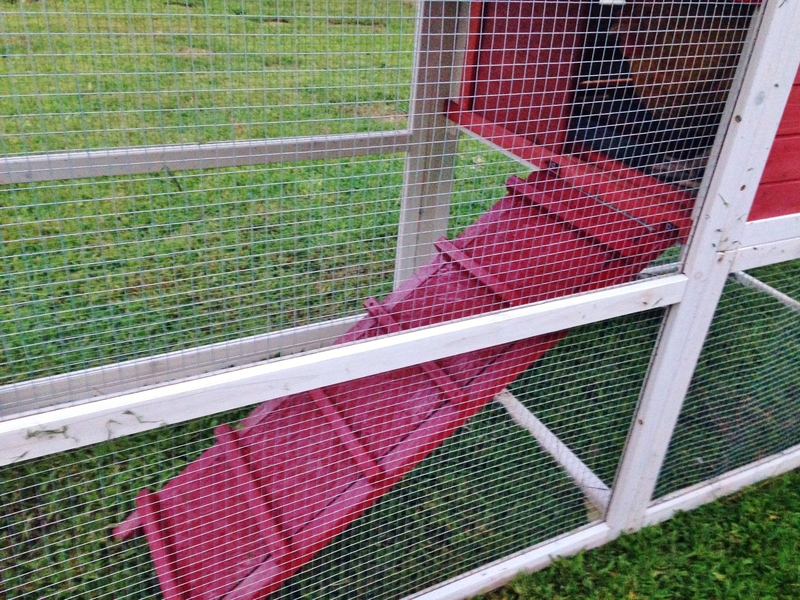 Daisy’s coop was cute and functional, but she was having trouble navigating the rungs of the ladder to reach her nest box. The girl is old, but she’s also very clumsy. Jim put some particle board under the rungs go give her an easier climb and he painted it red to match the color scheme. He also cut a section of plywood to make a top for shade and rain protection. Mulder tests the load-bearing function. I’m tasked to paint it and I guess I can’t expect the poor guy to do everything! Should it be white or red? Daisy enjoys visitors and treats just like any girl, so feel free to drop by for some chicken love anytime. I hope we’re in for a long peaceful experience with our pet this round. 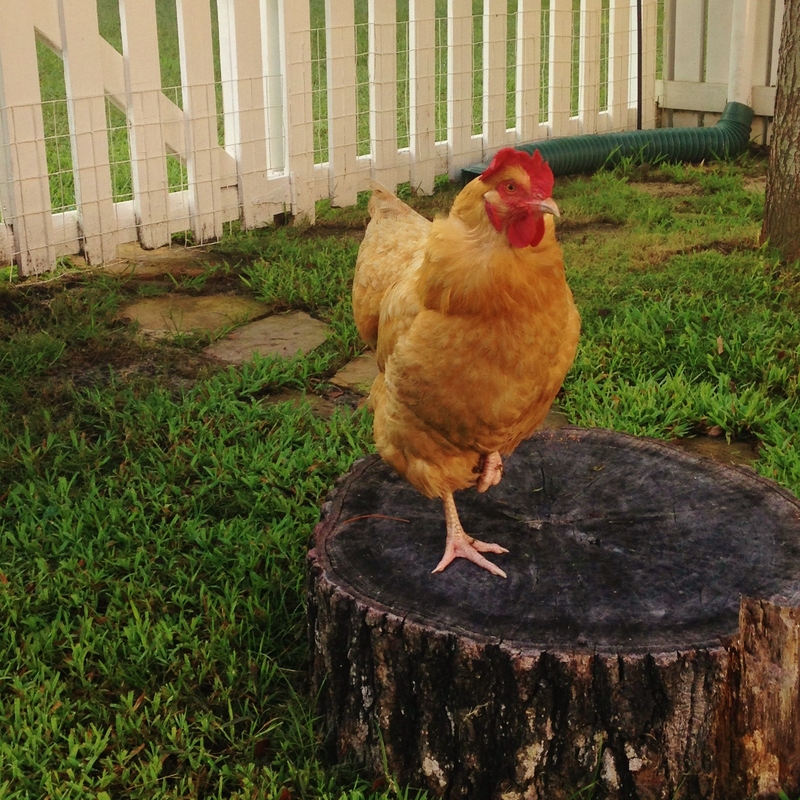 I hope that those who want to evict her, would first take some time to come to my home and see how this harmless, pretty chicken is an amenity for our neighborhood and an example of how backyard chicken husbandry is done! Daisy that’s the chopping block! NOOOOOOOOOOOOOOO! ← Nice Day For a…PINK WEDDING! Red. Won’t show the poop as bad. :0) I would love to paint the base trim on my house black to cover up the spiders and bugs that collect there every night. I think you should paint it white and let Daisy make red footprints on it. We are getting chicks this Spring.. Plan on researching and building coop/tractor this fall!!! So excited!! Cindy I am so excited for you!!! Mypetchicken.com is an EXCELLENT place to research breeds and order chicks. Please let me know if I can help in any way! You need to come see The Pink House!